As a wargamer, I have an abiding fear that one evening I will line up my army on the table, only to hear “They’re cute!” from my opponent who promptly gives my pretty soldiers a severe drubbing. That is how I have always thought about a Spanish Napoleonic/Revolutionary army; attractive but useless. That is until now with the publication of Esdaile and Perry’s Godoy’s Army, number 5 in Helion & Company’s superb From Reason to Revolution series. 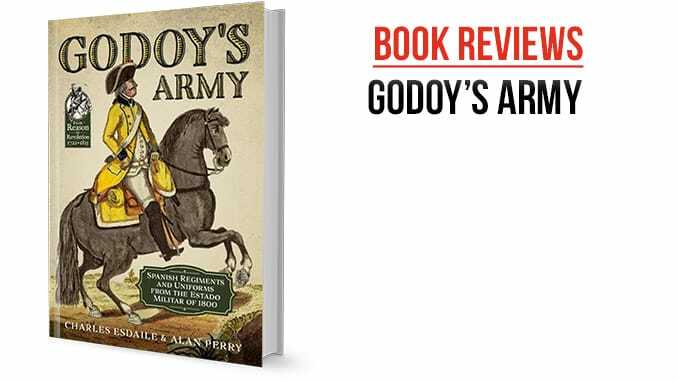 Godoy’s Army is a reproduction of a book dating from c1800, which shows many of the units of the contemporary Spanish army in full colour plates. I will not go into the individual plates here, suffice to say they are very impressive. They cover the infantry and cavalry but unfortunately not the artillery; we have details of them, however, from other sources. Each plate features a single figure, on a horse where appropriate, showing full details of their uniforms, though again there is a lack of equipment detail. That all makes a potential army pretty, but it is the excellent accompanying text by Charles Esdaile that reveals how the myth of the deficient Spanish army is false, especially in the 1790s, even if they did have significant problems. Esdaile and Perry have produced a wonderful book, particularly for uniformologists of the Napoleonic Wars. The text is well written, informative, and interesting, and the plates are outstanding. Maybe armed with this book, I will get one of these armies and challenge anyone to call it ‘cute’.